Here’s backing design option #2 for your number cards 1-20 playing cards. It has a rounded rectangle frame, but the four suit images are in a vertical line up. Print on the back of the playing cards and you’ll have a sharp looking set! 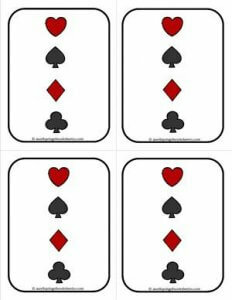 Please go to this page to see all the Number Cards 1-20 Playing Cards in this set.